Design your new fencing or leave the job to us. Our skilled team is experienced and able to handle every aspect of your project from removal of your old fence to installation of new products. Whether you're adding a fence for security or aesthetics, our contractors can help you meet all of your needs quickly. 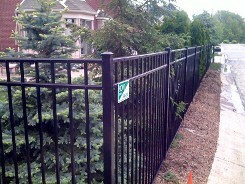 Let Novi Fence, LLC, provide custom fencing for your home, business, or organization in Southeastern Michigan. Our team offers the best in fence design and installation, using a wide range of materials. Choose from our vast selection of styles, colors, and products and count on us to install it, or you can do it yourself. Homeowners, school districts, municipalities, churches, and other organizations all know that Novi Fence, LLC, is the best choice for your fencing needs, whether you are looking for wood, aluminum, vinyl, or chain link fencing. Our fences provide security, privacy, and a stylish appearance, all backed by our customer service and quality craftsmanship. Turn to us today to build your next fencing projects throughout Novi and the surrounding areas. Our showroom and warehouse is easily accessible whether you are driving from the east, west, north, or south. We are located just a few minutes north of the Wixom Road Exit off I-96. Traveling north on Wixom Road, turn right (east) on West Road (first light north of I-96) and then right at Wall Street. We are located on the left side at 29330 Wall Street. Parking is available in the front of the building.